Chekawa Yeshe Dorje (Tib. འཆད་ཁ་བ་ཡེ་ཤེས་རྡོ་རྗེ་, Wyl. 'chad kha pa ye shes rdo rje) (1101-1175) — a famous Kadampa master renowned as the author of the Seven Points of Mind Training. Chekawa Yeshe Dorje was born into a Nyingma family. From an early age, he took the sufferings of others upon himself and felt natural joy in doing so. His potential and capacity for the Mahayana were greatly developed. At the age of twenty-six, in Yarlung, he heard the Eight Verses of Mind Training of Langri Tangpa from Geshe Nyangchak Shingpa and this was the cause for his devotion to the Kadampa teachings. He was confident that the bodhichitta of exchanging oneself for other is the fundamental basis of the mahayana teachings. For four years, he studied with Potowa’s disciples Geshe Dolpa and Luk Mepa, receiving instructions on the texts of the Kadampa tradition. Having developed deep confidence in bodhichitta, he arrived in Uri at the age of thirty in search of the instructions on mind training. He received teachings from the great Sharawa for two years, but during this time he never heard even a casual reference to these instructions. Feeling somewhat doubtful, he asked his teacher, “Is the exchanging of oneself and others not the root of the Dharma?” To which Sharawa replied that it is indeed indispensable as a method for attaining awakening and made this clear with a quotation from the Precious Garland. Gaining confidence, Chekawa requested the instructions. 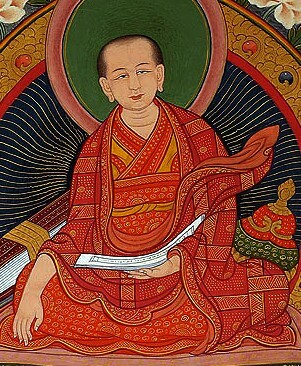 Sharawa accepted and Chekawa studied with him for nine years — first for a period of six years and then for three more years later on — and focused entirely on this practice, receiving teachings and meditating upon them, so that he cut through the bonds of self-cherishing, and bodhichitta was truly born within his mind. Matthew Kapstein, 'Preliminary remarks on the Grub mtha’ chen mo of Bya ’Chad kha ba Ye shes rdo rje.' in Sanskrit manuscripts in China. Proceedings of a panel at the 2008 Beijing Seminar on Tibetan Studies, October 13 to 17. Edited by Ernst Steinkellner in cooperation with Duan Qing and Helmut Krasser. Beijing: China Tibetology Publishing House 2009. This page was last edited on 21 January 2017, at 22:20.